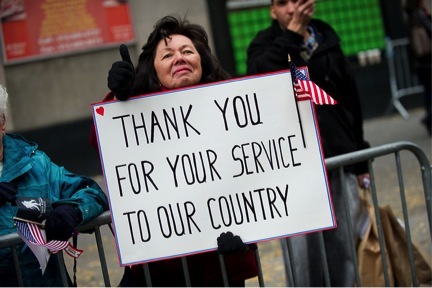 IAVA is a small, innovative nonprofit organization dedicated to the newest generation of veterans. It is with the help of committed supporters and volunteers that we are able to reach our mission of improving the lives of 2.4 million Iraq and Afghanistan veterans and their families. An hour of your time can have a huge impact. IAVA offers a range of volunteer opportunities for those looking to get involved, from supporting campaigns and programs in our NYC and DC offices, to helping with membership events on the ground, at partnership events throughout the country, and on projects within your local community. Sign up below to volunteer for IAVA by entering your email and community, and selecting your preferred activities. Show veterans of Iraq and Afghanistan you’ve got their back!